Condition of use : If you want to use this photo please contact the Museums of Annecy. The Annecy Museum, which was created in 1842, was first established in the Town Hall and the Palais de l’Ile before being moved to the Castle in 1961. The Annecy Museum invites you to discover the diversity of its collections, our rich regional heritage, and an educational approach to the natural lake environment. The museum also aims to promote contemporary creation, and houses an impressive collection of contemporary art. 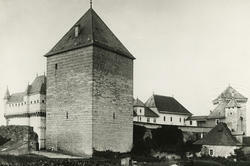 The Annecy Castle was listed as a Historical Monument in 1902. It was the residence of the Counts of Geneva until 1394. Numerous transformations during the 15th and 16th centuries gave the castle its unique appearance, a blend of medieval defensive architecture and elegance in the French renaissance style. Abandoned as a residence in the 17th century, it was used as military barracks until 1947. The Castle was acquired by the Town of Annecy in 1953. The first exhibition was launched three years later, and was the start of a new era for the former royal palace, which has since then been dedicated to culture. The museum boasts rich and diverse collections of objects and art, displayed throughout the temporary and permanent exhibitions and presented in the fully restored rooms of the castle. They comprise objects linked to regional heritage and lake architecture, medieval sculptures, alpine landscape paintings from the 18th to the 20th centuries, as well as contemporary works of art that question the relationship of man with his natural environment. The ticket to the Musée-Château includes a visit of the Regional Alpine Lakes Observatory (ORLA), which comprises 700 m2 of exhibition area in the Tower and Logis Perrière. Visitors are invited to discover the complex, fragile and coveted environment of alpine lakes through unique displays based on five fields of scientific research: biology, ecology, ethnology, archaeology and limnology. The Observatory was created as a response to the concerns of the local population wishing to protect the quality of their environment. It aims to showcase and protect the natural alpine environment.